Article received from: "The Cape Odyssey"
Cape Columbine, a majestic headland on the Cape’s West coast, is a mere two-hour drive from Cape Town. It is situated in the Tietiesbaai nature Reserve, almost 5 km from the picturesque little fishing village of Paternoster. Paternoster is well known for its crayfish and other seafood delights and reputedly derives its name from the thanksgiving prayers of shipwrecked Portuguese mariners. Early maps consistently record the place name as ‘St Martins Paternoster.’ Cape Columbine owes its name to the British wooden snow ‘Columbine’ which was wrecked in 1829, 1,5km north of the lighthouse. Prior to the installation of the Cape Columbine lighthouse, the coastline was the burial ground of several ships. In 1876 the iron steam troopship SS Saint Lawrence was wrecked on Great Paternoster Point. Bound for Cape Town she was carrying the 2nd Battalion of the 3rd Buffs. No lives were lost. Other ships to meet their demise in this region were: the Portuguese twin-screw mail-steamer SS Lisboa (1910), SS Haddon Hall (1913), SS Malmesbury (1930) and the SS Haleric which floundered off Cape St Martin (1932). Urban legend has it that the SS Lisboa was laden with a large quantity of red wine, which stained the sea. Fortunately, a large number of unscathed barrels which washed ashore, were buried by the locals and retrieved much later after exasperated custom officials had finally returned home! The provision of a lighthouse on this piece of coast lay in abeyance for many years. The Lighthouse commission of 1906 recognised that Cape Columbine would be a suitable location for a lighthouse. Dassen Island and Pelican Point at Walvis Bay, however, appeared at the time to be more urgent. It took thirty years and much debate before the construction of a lighthouse at Cape Columbine got the nod - much to the relief of the local fishing community. Around the turn of the twentieth century Harry Claude Lee Cooper was appointed as engineer in charge of lighthouses. Columbine was the last lighthouse H.C. Cooper designed. He decided on the site known to the locals as Castle Rock, a massive granite outcrop a few hundred meters from the sea. The design of Cape Columbine lighthouse was quite different from the conventional tapered circular tower. His design was a slightly tapered square tower with the outer faces of the walls recessed, thereby forming heavy buttresses on the four corners. The building is painted white while the lantern is red. Columbine was the first lighthouse to receive all three navigational safety features, ie, a light, a fog signal and a radio beacon. The optical apparatus, supplied by Messrs Chance Brothers, was the first lens system designed for use with a 4kW incandescent electric lamp on the South African Coast. All prior installations had been designed for wick or petroleum vapour burners. 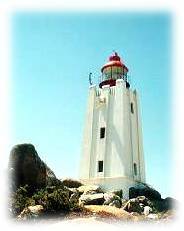 Thirty years had elapsed since the lighthouse commissions’ report and navigators and every person from the Berg River mouth, Vredenburg, and Saldanha Bay, waited anxiously for the Columbine light to become a reality. They watched with anticipation as machinery and equipment were transported over rough countryside to the rocky prominence. The moment of glory eventually arrived on the 1st October 1936. As the sun extinguished itself on the Atlantic horizon, Mrs H.C. Cooper set in motion the impressive lens. Two brilliant white beams penetrated the evening air over the formidable Britannia reef.